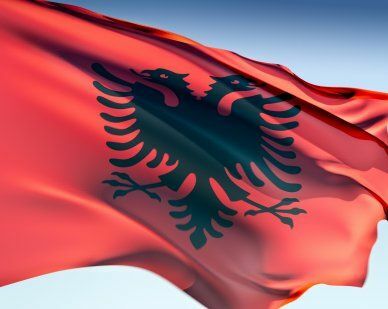 The Albania flag consists of a red background and a black two-headed eagle. The eagle represents the famous George Castriota, also known as Iskander Bey, or Skanderberg. The eagle has been featured on the flag since Albania's independence from the Ottoman Empire in 1912. In 1946, when communists overtook Albania, the flag featured a yellow border and red star. This was removed in 1992 when Albania became an independent republic. Our top-quality Albania flags conform to all official specifications. Emblems and designs are executed with the highest possible degree of accuracy in regard to detail, color shades, placement and proportion to flag size.